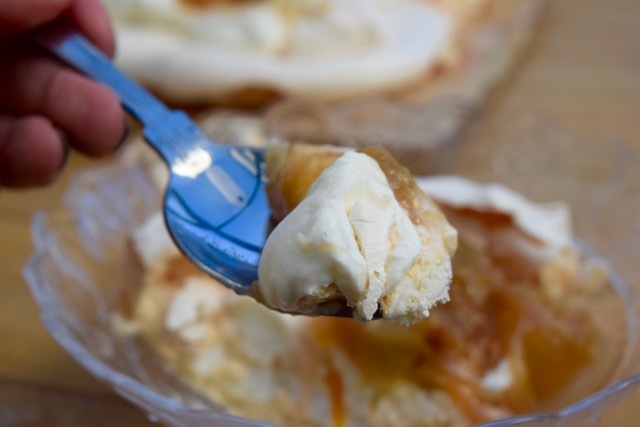 It’s nearly summer *ish* so time for a light and fresh tasting dessert for the whole family to enjoy. 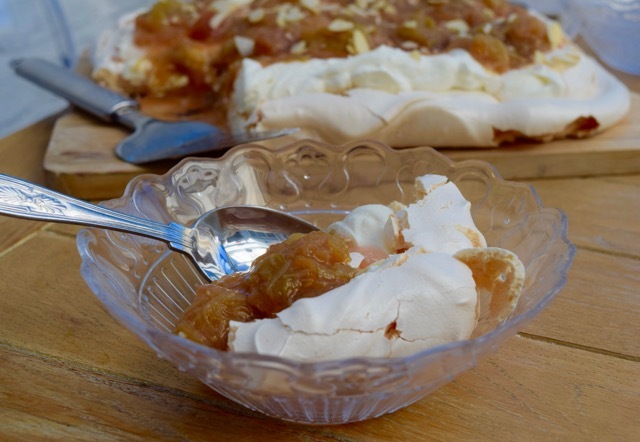 What a beautiful marriage, much like Clyde and myself, are Rhubarb and Meringue. One tart and one sweet, the dessert that is, not Clyde and I although that may not be too far from the truth. Rhubarb and I are old friends. 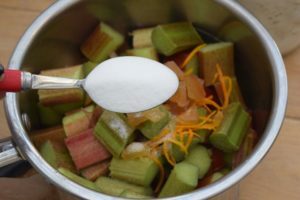 When I was on the Ducan diet *low carb and low fat and low fun* the only fruit you were allowed to eat was Rhubarb mainly because it is not a fruit, it’s a vegetable. Subsequently I reached a point when I didn’t care if I never saw another stick of the stuff again. 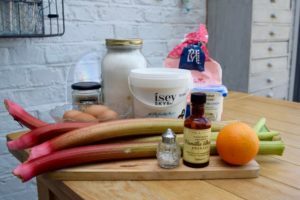 That moment has passed and Rhubarb and I are firm friends again, based on the fact my Rhubarb Gin is one of my most popular Lucy Loves posts and that it’s too delicious to fall out of love with for long. 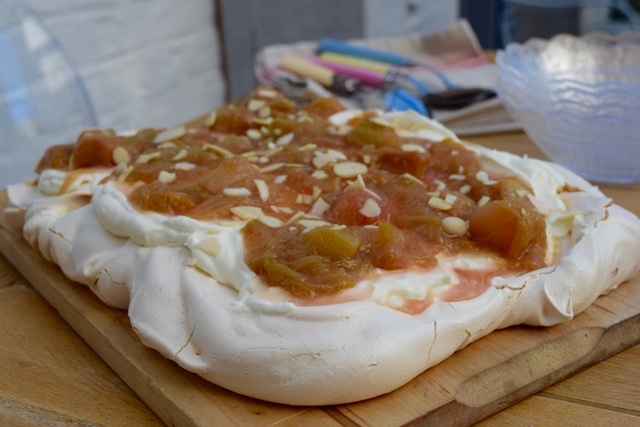 So, here in perfect harmony, is a Rhubarb and Meringue Tray Bake recipe. 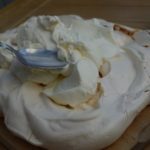 Meringue had always been a slightly failure for me in the past. Falling to pieces, not chewy and generally just being rubbish and slightly flat. Hooray for mastering them in my mid *to late* 40’s and now I love whipping up a batch of meringues or a pavlova at the drop of a hat. 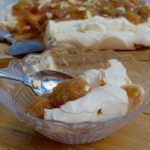 This Rhubarb Meringue Tray Bake is a rustic, less fussy version of a pavlova and seems less formal, much more my style with some rougher looking edges. The base is crisp on the outside, soft and chewy in the middle with a cream and fat free yoghurt filling making it lighter and a tiny bit healthier *not really*. This is then crowned with a puddle of poached rhubarb, cooked with some stem ginger and just a touch of orange zest for luck. There’s tons of rhubarb spare to serve alongside the dessert or to accompany some granola for breakfast the next day. 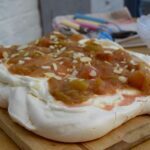 You can make the meringue in advance, just don’t assemble the actual dessert until the last minute. You don’t want a soggy bottom to disappoint your dinner guests. The inspiration for this pud comes via the ever helpful, Jamie Oliver, with huge thanks. This pudding screams of warm summer lunches, eating in the garden, fuelled by rosé and lasting much longer than you planned. After the warm long weekend, I will feel slightly cheated if every weekend is not like that for the next few months. I do hope I won’t be disappointed. This post will appear on Lucy Loves later this week. Make a start by pre heating your oven to 150 degrees fan assisted and lining a large rectangular baking tray with greaseproof paper. 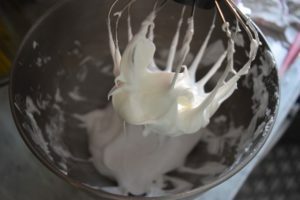 In your stand mixer or in a bowl with a hand mixer whisk the egg whites until they reach the stiff peaks stage. Gradually add the caster sugar whilst whisking, along with the pinch of salt, until all the sugar is added. 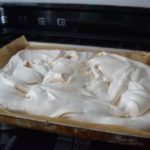 Keep whisking until the meringue is glossy and when you rub the mixture between your finger and thumb you can’t feel any grains of sugar. 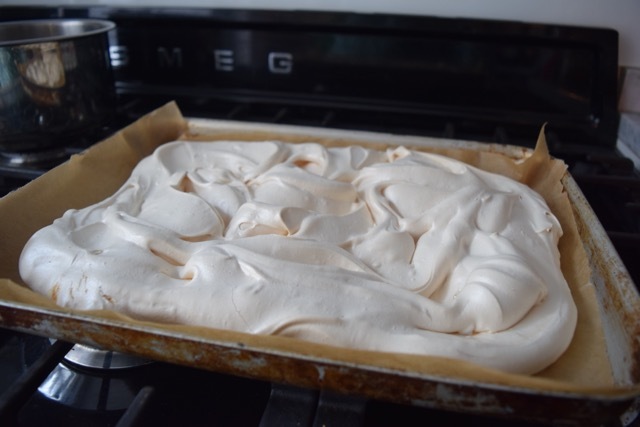 Scrape the meringue into your lined tray and smooth into a rectangle around the size of a sheet of A4 paper. Place into the pre heated oven for around 50 minutes to 1 hour. 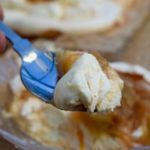 The tray baked meringue should be just crisp and golden while still slightly soft in the middle. Remove from the oven and leave to cool completely in the tray. 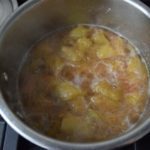 While this is cooking, prepare the rhubarb. Trim and chop into 1 inch pieces and place into a large saucepan. 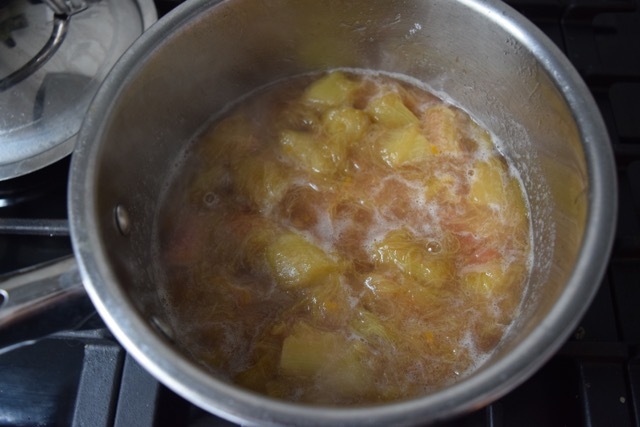 Add the zest and juice of the orange, the vanilla extract or pod and the caster sugar, to taste. Slice the pieces of stem ginger and add to the pan then put onto the hob and bring up to the boil. Turn the heat down, pop a lid on and cook for around 10 minutes or until just cooked through. Leave to cool. Just before you are ready to serve your dessert, assemble the toppings. 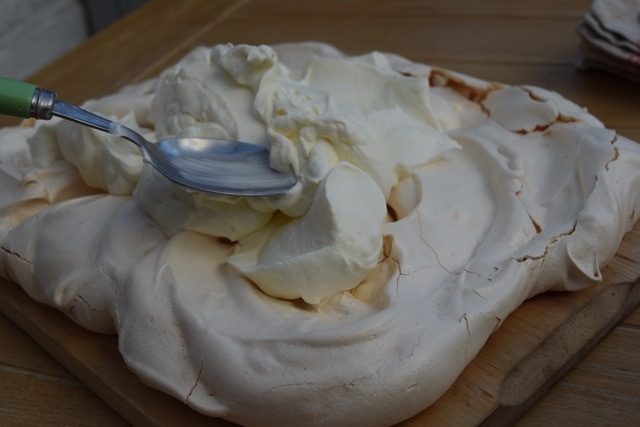 Remove the baking paper from the meringue and carefully place onto a board or presentation plate. Whip the double cream and icing sugar until it holds soft peaks. Fold in the yoghurt, mix, then spoon this onto the meringue. Drizzle on the cooked rhubarb and reserve the rest for serving alongside the dessert. Garnish with toasted almonds or crumbled ginger or amaretti biscuits and orange zest then serve, straight away, in large slabs. Any leftovers can be kept in the fridge but will be a little soft, but nonetheless still delicious.